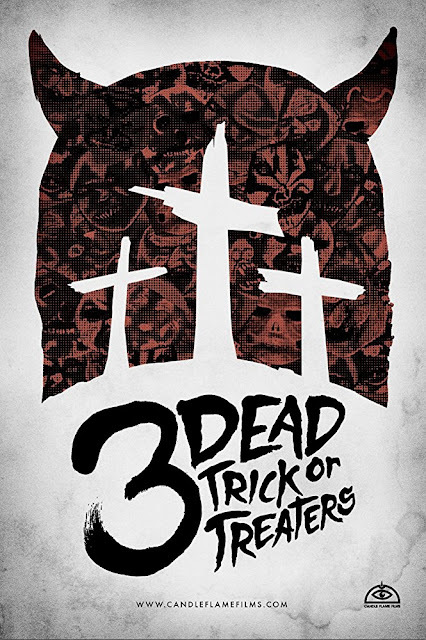 3 Dead Trick or Treaters is a Halloween themed horror anthology film that was written, directed, shot, and edited by Torin Langen over 4 years. I love anthology films, especially if they do something a little bit different, and sure basing an anthology around Halloween isn't anything new (Trick 'r Treat for instance) but this one goes the extra mile as there is not a single line of dialogue in the entire 73 minute run time. 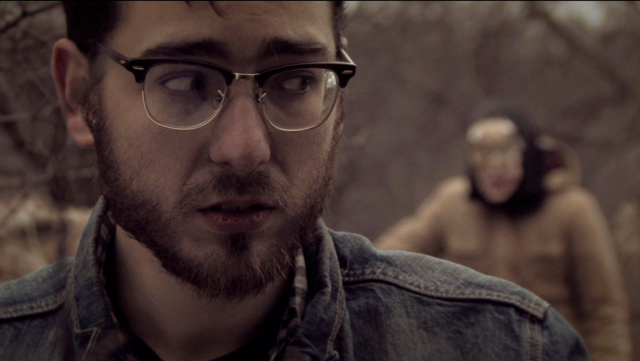 Including the wrap-around story there are five different tales contained here, all of which ooze with quality which you don't usually see with indie movies of this type. So the one that ties everything together is the titular 3 Dead Trick or Treaters. 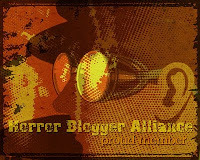 A paperboy concerned about the number of papers left outside a customers house decides to check out the property, in the backyard he discovers three newly dug graves, each one with a Halloween mask hanging on a crudely made crucifix, each one also has a short story tacked to it. His curiosity gets the better of him and he decides to read them. A lot of the time the wrap-around story in anthologies is bare bones and doesn't do much to excite. However this one is pretty fantastic (with great use of banjo), it even sets up a few little cliffhangers so when another short starts I found myself desperate to return here. Special mention has to go to both the intro and outro credits, the former is a stunning portrayal of a crazed writer and his increasing madness at not being able to get published. The music, the editing, the off kilter angles, and the close ups on the mad man meld together simply perfectly and let me know straight away this anthology was going to be a great one. The music that opens and closes the films is great, that and the style brought to mind a punk aesthetic that goes so well. Also the wrap-around features a special effect that was ripped straight out of The Evil Dead, made me grimace seeing it, lovely stuff. It took me until partway through the first complete film Fondue to remember that in the email Torin had sent me about his film that he had mentioned it was totally dialogue free. Truth be told I was a bit concerned, I worried how my interest would be kept, I feared I may get bored. This all got swept away when the crux of Fondue started. Two teenagers buy Halloween masks and bowls in order to go trick or treating. They arrive at a house and a mask wearing figure answers and beckons one of them inside... for a special type of fondue. The masks sold this one for me, with no one talking and everyone wearing masks this became creepy to watch. I love how much expression can be told just by gestures and body movements, never does it seem like people are over acting to compensate, it just seems like talking just isn't needed. This is a weird story but it works well, my only real complaint is that I felt like the home owner should have been an older person, his hand when he beckons the trick or treaters in is a young hand. A bit of a strange thing to have an issue with, just my personal preference. The second story is Malleus Maleficarum in which a religious small town have taken passages from the bible to heart and rounded up all the perceived 'mediums and necromancers' of their town to met out their own form of perverted justice. This one has a great violin to accompany the soundtrack. With no dialogue it is the music that provides the emotional beats here and I can't stress how effective it is in every single film contained within this anthology, it is a work of genius by Stephen Schooley who provides the original soundtrack. This one shared many similarities in my mind to Fondue which I found a bit odd, both had a male and female couple as main leads, and both had the female taking charge of the situation while the male appeared to be hesitant to what was going on. They do eventually go into separate ways but I did wonder if these originally were one story that was then diverged into different ones. 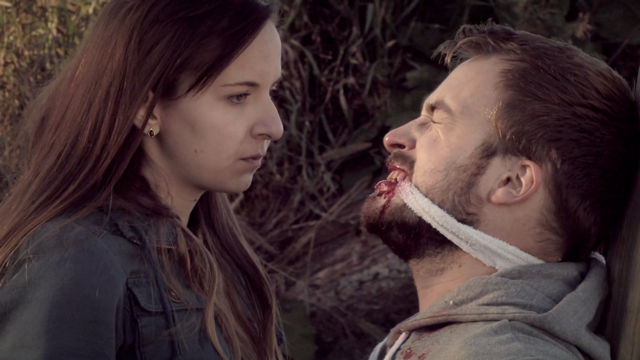 Next up is Stash which was the weakest of the five shorts. Three homeless people have been trick or treating and had agreed to pool their earnings together and bury them out in the woods for when things get desperate. However one of the three had already eaten his contribution and this leads to problems. Thematically this shared a lot in common with Fondue with cannibalistic actions coming to the forefront again, it also seemed that a severed hand prop was maybe reused here as well. Still there are some great blood effects here. Final film is Delivery that is about two rural policemen who go out on patrol, seemingly in a bid to try and find any of the many missing people that have been reported in the area. 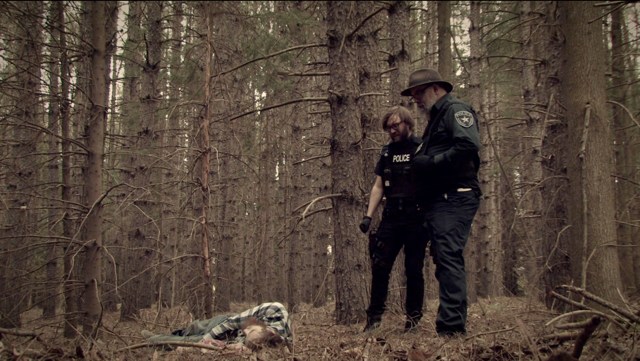 The two leads here were fantastic, I especially thought Ryan Leandres stood out as 'Young Cop', the anxiety his face displays spoke volumes, such as when his partner gets him to go to a house and tell the owner they have found the body of their loved one. An issue I had with this is that there is a man wearing a chequered shirt, he features in the ending and so when the story returned to the wrap-around one and a similar looking character who was also wearing a chequered shirt features I admit I had to rewind a bit to unravel the slight confusion in my mind as I thought it was still Delivery playing..
3 Dead Trick or Treaters is an attractive and crisp film with plenty of beautiful imagery of the Autumn season. The music is in sublime marriage with the arresting visuals and is an essential part of the overall experience. As a result of no dialogue the stories themselves are pretty simple and so they may not stick in the mind long after the fact, a possible argument of style over substance could be made. It can't be denied the shorts all share similarities between them, but as a pure experience there isn't an anthology quite like this, if you get the opportunity this should be seen. 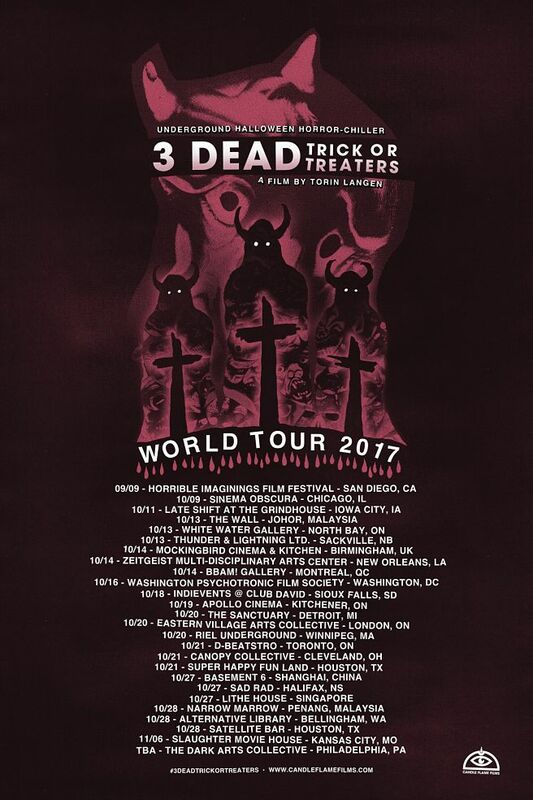 At the moment 3 Dead Trick or Treaters is having a world tour of sorts, being shown around the globe (a benefit that no dialogue brings), check out the tour poster and the trailer for this film below.